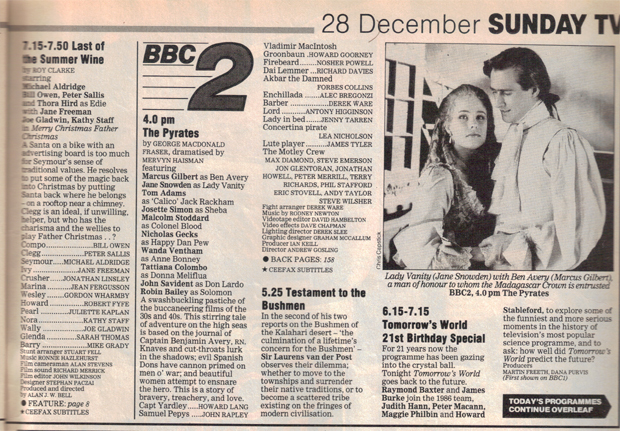 Andrew: It’s worth pointing out that, if I had gotten my act together, we would have published this entry in time to mark the episode’s 30th anniversary on the 28th of December 2016. Then, it snagged 16.3 million viewers! Still, it wouldn’t really be Summer Winos if I had pulled my finger out. 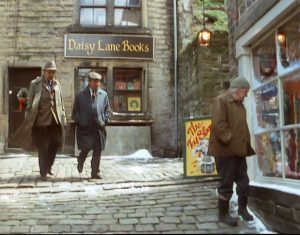 Three decades may have passed, but the bookshop, Daisy Lane Books, seen in the background of this Christmas special’s first scene is, remarkably, still trading and looks pretty much the same! We’d been visiting Holmfirth for years before we noticed this little gem of a place, tucked away in a cobbled passage just off Towngate. I can’t vouch for the fact that the toyshop the trio admire was ever actually a toyshop, but today the building houses the thematically-named Daisy’s Nails and Beauty. Bob: What are we waiting for? It’s time for my traditional New Year pedicure! And hey, you know you’re in for a classy Summer Wine when the opening line is an inexplicable non-sequitur. They used to be Foggy’s exclusive domain, but Clegg seems to have inherited them now. ‘He said it was part of his mid-life crisis,’ he ponders. ‘Left him with this yearning for Salad Cream’. Marvellous. Anyway, what the hell is going on here? Not only is this a very Christmassy Christmas special, actually set at Christmas, but there’s snow on the ground too! Is it real, do you think? Usually, when fake snow is pressed into service for sitcom Christmas specials, the BBC props boys (warehouse coats, flat caps, jam-jar glasses) go overboard and spread the stuff everywhere. But these sparse fringes of snow, clinging desperately to the grass verges and pavements, look like the real deal to me. Andrew: Exactly! It does look very convincing – mainly because it’s quite patchy and paltry looking! Surely if you were to cover the landscape in fake snow you’d do a more even job than that? What we need is access to the production paperwork and some detailed records from the Met Office. Bob: It’s curious that we didn’t get a Summer Wine series in 1986… meaning that Seymour’s first two episodes are two Christmas specials, almost exactly a year apart! Do we assume that a year has passed in Summer Wine world as well? I’d like to think so, because – despite having a somewhat frosty relationship in Uncle of the Bride – Compo, Clegg and Seymour are now clearly as thick as thieves, giggling away merrily together. The latter in particular has noticeably softened since his prickly and pompous debut appearance, and seems full of genial Christmas spirit. He’s almost a different character. Andrew: The whole episode seems imbued with Christmas cheer for a change. Maybe it’s because the characters can actually hear Ronnie Hazlehurst’s lovely, sleigh bell-coloured score? That’s what’s doing it for me! He really gets into the spirit for this one, with some lovely quotations from Have Yourself A Merry Little Christmas and Good King Wenceslas. As for the missing year between specials, who knows what our trio have been up to? If this was Doctor Who, several thousand books, comics, and audio plays would have been written to fill this continuity gap… and it would all be utterly mental. Bob: This is the first time that one of the main trio has had their family featured regularly in the show, isn’t it? It’s only their second episode, but Barry, Glenda and Edie already feel like part of the Summer Wine furniture. Roy Clarke’s blending of them into the usual mix has been effortless; and you’re right with what you said in our Uncle of the Bride review, too… the fact that they’re also closely related to an established character – Wesley – has helped a lot. These characters aren’t just suddenly being foisted onto us out of nowhere… we’re just getting a wider glimpse of an already existing world. Anyway, I like the fact that Edie’s house is festooned with balloons. Do people still put common-or-garden balloons up at Christmas? She can on put her posh voice as much as she likes, balloons on the walls are a sure-fire sign of a working class upbringing. You couldn’t move in our house for Christmas balloons; those and about forty miles worth of paper chains, all held together with my juvenile spittle. Andrew: Yes, the set dresser has really nailed the Christmas decorations. They aren’t overdone, and they stem from character, rather than simply what looks good on camera. See also the tatty, folded Santa Claus poster in the Café window! While we’re on the subject of Edie’s house, I’d like to once again highlight some interesting direction from Alan Bell. At the start of the scene, we can hear Edie’s voice for a moment as the camera dollies in on the empty, sitting room doorway. It’s a very simple move, but also strikes me as very unusual for a multi-camera sitcom. This continues throughout the episode. I’d say this is a sign of a director who is trying his best to make the videotaped studio sequences as dynamic as those he is able to execute on film – a medium in which he clearly loves working. Bob: There’s a poster in the café advertising a ‘Carol Service, St Agnes Church, 20th December 6.30pm’. Is St Agnes Church real? Can we go there and sing carols one year? Andrew: There’s a St Agnes Church in Leeds… but I suspect we may be thirty years too late for the advertised event. Bob: I keep saying it, but I genuinely can’t fault the seamless way in which the new cast members have been weaved into the Summer Wine narrative over the course of – let’s face it – only a handful of episodes. Here we’ve got Crusher being interrupted in the café by Marina, who gives Clegg a present to pass onto Howard, away from Pearl’s prying eyes. And it all feels utterly natural. There have been eight major new characters introduced since the start of Series 8, but it doesn’t feel at all contrived. Andrew: I love the fact that Marina’s Crusher crush has been carried over from Uncle of the Bride. We said at the time that it would be a shame if that dynamic was forgotten about. It also means I can stop writing all of that slash fiction… I was developing carpel tunnel. Bob: I’ve absolutely no idea what carpel tunnel is. Is he in the new Star Wars film? Anyway, Drew… a little straw poll here. What was the name given to the beardy Christmassy bloke in your house when you were little? And if you say Noel Edmonds, I’ll clobber you. 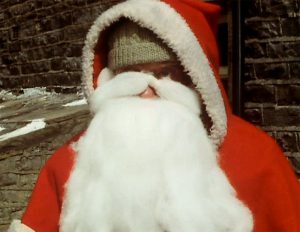 He was always ‘Father Christmas’ in our house, never ‘Santa Claus’. I’m turning this review into a #festiveclasswar, actually… I’ve always thought there was a hint of middle-class affectation about ‘Santa Claus’. So I’m glad to see that the slightly skew-whiff looking figure that our main trio pass in the street is very firmly referred to by them all as ‘Father Christmas’. Andrew: I beg to differ on this one. He was always Santa Claus to us, and it’s actually ‘Father Christmas’ that strikes my ears as a little… poncier. Subjectively, I think this is actually more of a generational thing. Father Christmas is the more British of the two terms, with a lineage that goes back to Pagan festivals, wheras Santa Claus has his roots in the Sinterklaas of Dutch tradition. Dutch settlers carried that tradition over to the American colonies, which in turn led to Santa Claus becoming the dominant nomenclature there. As the latter half of the 20th Century moved along, British Christmas traditions became more and more entwined with those of America; particularly in terms of popular culture. Holiday films, television specials, and pop songs far more frequently featured ‘Santa Claus’, and so – by the time I was growing up in the early 1990s – I would say naming him as such was pretty much the norm. Basically, blame Dudley Moore. Juliette Kaplan plays Pearl wonderfully in the scene in which Clegg attempts to covertly deliver Marina’s present to Howard. She delivers perfect menace, but you can’t help but be on her side. And it’s just occurred to me that this instalment still isn’t exactly about Christmas, but rather the intense preparations that lead up to the day. The decorations, the shopping, the strategic gift giving – Roy Clarke is still complaining! Bob: Our trio next retreat to a tinsel strewn pub. A great line from Seymour here; ‘You put a couple of schoolboys together and they start fermenting’. He’s got a much more of an acid wit than Foggy, hasn’t he? He can be very cutting and acerbic. Wally and Nora. Wally and Nora. #wallyandnora. I can’t say any more about these little scenes, Drew… they’re perfect, I’ve exhausted my superlatives. I’ll leave you to quote Wally’s killer line here! Bob: Can we edit all of Wally and Nora’s recent self-contained scenes together, and make a half hour sitcom? Come on… what else have we got to do that’s more important? Andrew: I’ll have a Christmas special prepped for 2017! Back in the pub, Seymour can’t help but intervene in what I would nominate as one of the most poorly-choreographed bar-room brawls in television history. Two extras giving each other some very gentle shoves while standing silently and puffing their cheeks. Edie: Are you happy, love? Glenda: Oh, we’re fine. He’s a good, steady lad. It’s heartbreaking, isn’t it? I mean, I don’t doubt for a second that all of these Summer Wine married couples actually love each other… it’s just the ‘anything for a quiet life’ acceptance of the aching dullness of it all. The endless days eating their dinners and trudging around shops and wrapping their Christmas presents with the telly on, without a single breath of excitement to spice things up. And yet the fact that Edie even asks the question suggests that she might just pine for something more. Something more than a husband who spends every daylight hour under the bonnet of his car, and sits on sheets of newspapers in his overalls every night. The unspoken melancholy of all of these relationships is just so bittersweet. Andrew: They’re real people. Clarke sometimes gets stick for the lack of plot in his work, but so frequently it is during these side scenes that the most human moments sneak into the dialogue. Bob: Let’s cut to the Christmas crux #christmascrux. Seymour is determined to ‘put the magic back into Christmas’, and wants Compo – dressed as Father Christmas – to stride around the town’s chimneytops, giving it as much ‘ho ho ho’ as he can muster. And so we have a dry run on Seymour’s roof, with poor Compo shoved to the highest point with a long, padded ‘thingummy’ administered by Wesley and Barry. And do you know what? I’m definitely claiming this wintry landscape as real snow. I’ve spent enough afternoons trudging around the moors in December to know real snow when I see it. Those yellowy-grey skies are positively bulging with the stuff as well… I bet Holmfirth was under a beautiful blanket the following morning. Insert your own Marina joke here. 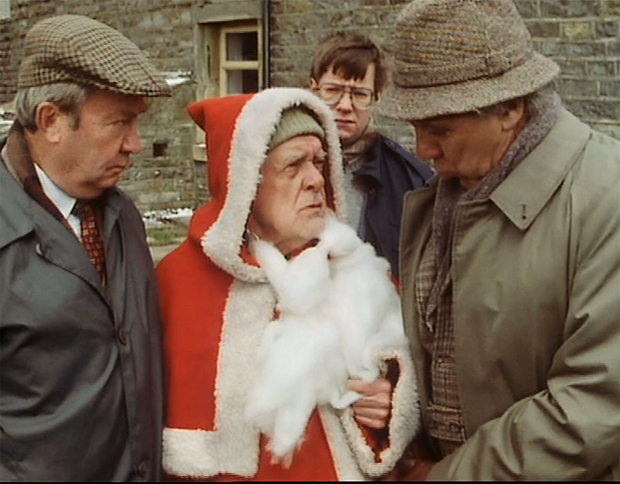 Andrew: I don’t know about you, but nothing quite says Christmas to me quite like Bill Owen shagging a chimney pot. When Roy Clarke is on form, he writes dialogue worthy of Alan Bennett. We’ve got Nora, Ivy, Pearl and Edie on the steps here discussing their respective husbands; and it’s glorious. No wonder Roy Clarke ended up incorporating having those regular ladies’ coffee mornings; they’re the perfect vehicle for these brilliantly catty exchanges: ‘Mrs Nuttall saw hers getting off a bus in Halifax with a man,’ nods Edie, knowingly. Nora has little sympathy, though. ‘That Emmy Nuttall wants to mind her own affairs,’ she harrumphs. ‘She can’t make mince pies. She’s very heavy-handed with the fat’. Andrew: Prolific stuntman Stuart Fell can be spied in long shots that require Compo’s full body to be seen astride a roof in the town centre, but Bill Owen was also clearly willing and able to climb up as well. The closer, full-bodied shots reveal him to be clowning around on what looks like an actual rooftop. I’ve studied it as closely as a Standard Definition DVD will allow, and as far as I can tell it isn’t a mocked-up roof, and it certainly isn’t making use of CSO. Bob: Stop sitting so close to the telly, your eyes will go all funny and you’ll need to wear glasses when you’re older. Still I can confirm that’s definitely the real Kathy Staff giving one of her little semi-smiles as Compo dangles from the rooftops and declares his festive feelings for Nora! Staff is magnificent at ‘that look’… it’s barely a twitch, but there’s such affection in it. Andrew: There’s also a lovely little throwaway moment during the credits, where Seymour rewards Compo for his efforts with some bottles of beer produced from beneath Father Christmas’ robes. There; I said Father Christmas. Happy? Bob: I’m always happy. That was a really sweet and fun little episode; possibly one that gets overlooked a bit, falling so oddly between Uncle of the Bride and Seymour’s first full series. But I liked that a lot, it made effortless work of a tough job, getting the new characters further bedded in. And you can insert another Marina joke of your choosing here, if you like. Go on, it’s Christmas. Andrew: Keep your filthy mind to yourself, spotty little person; it’s January. Anyway, this was very enjoyable. It’s silly Christmas fluff for the most part, but sometimes that’s exactly what the season calls for. It didn’t surprise me the Seymour didn’t last all that long. There was something that didn’t quite work in the dynamic for me. And it wasn’t anyone’s fault. As you say, the one liners are a touch more laced with acid, and the wider ensemble I think was added to make things that little bit less dependent on that dynamic. It’s still good fun though. Hello, for me the Seymour era was excellent as the episodes he was the team leader were very busy and active, I especially loved the Christmas episodes like runs and what’s Santa brought for Nora then plus merry Christmas Father Christmas, I think his sad leaving was a big loss but when foggy came back the show was saved and we are all the benefactors of this, Summerwine will be forevermore for me a most magical experience to watch on an endless loop, love it. Michael Aldridge is a great actor and Seymour is a decent enough character, but the problem for me is that had he not been there then the plots would have been exactly the same if there had been any other Third Man. Seymour wants to the inject the magic back into Christmas here, but that idea would have worked exactly the same with Foggy I suspect. Oh, and we were a Santa Claus house too and we are as working class as they come. Funny I really can’t see Foggy putting the magic back into Christmas and I have a feeling he’d be very anti-Father Christmas and more pushing the religious elements of Christmas. Ah, really? I can definitely see Foggy pushing a scheme to put the magic back into Christmas… he’s very whimsical when the mood takes him. Oddly enough though, I can imagine Blamire wanting a more religious Christmas. Hmm actually you are right that Blamire would push the religious aspect. 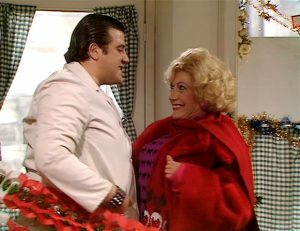 “Nothing quite says Christmas to me like Bill Owen shagging a chimney” -I’ve going to get that printed on a T-Shirt Xmas 2027. I seem to recall reading that this was produced at the end of Seymour’s first season which would explain the tight nipped relationship between the new trio. 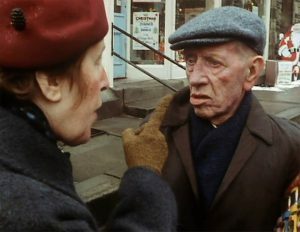 Sadly it would appear that if it was the last one produced it means that that small exchange with Nora would have been Joe Gladwin’s last scene filmed, though Alan Bell claims Wind Power was his final show. You could understand this being episode filmed towards the end of the run, to at least try and capture some vaguely wintry weather. Just a note on the subtle snow, it was all fake snow. While i was with the show we never filmed in winter in Holmfirth. The Studio scenes were all done in the autumn. Oh and it was a mixture of Santa and Father Christmas in our house, Mother from Durham and Father from Kent, make of that what you will. I feel cheated by the fake snow! Television is a WEB OF LIES! The fake snow is probably a giveaway because there’s a little of it in lots of scenes. CLEGG: Christmas comes but once a year – and still we can’t afford it! Seymour moving Crusher’s stepladder whilst he’s still on it is a bit reckless, not to mention a test of strength. Edie mentions a dentist and 2 quantity surveyors in their street, which is a different slant than naming names. Jackie Pilsworth was another on the books of Northern Dairies. NORA: Don’t lag behind when I’m nagging you! Compo is still wearing his hat, even when in the FC red cloak. WESLEY: Just let your mind go numb, Barry. I don’t mind Seymour, of whose many quirks is included praying to God. SHUT UP, BARRY, THERE’S A GOOD LAD!